Who would have imagined New Orleans Mardi Gras would come to Lorain County Ohio! But it is! The first annual New Orleans Mardi Gras celebration Lorain County style is going to be so much fun! 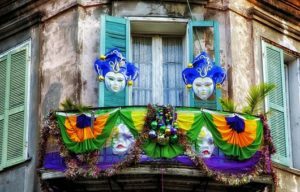 And 1830 Hallauer House B & B will be providing the above Mardi Gras Overnight Special!. This would be a great week to take that winter getaway! The big event is the brain child of the Lorain County Visitors Bureau with the adopted NOLA theme “Let the good times roll!” All of this fun will begin on March 1 and end on March 9. During those 9 days you will be able to travel to all the participating businesses around Lorain County. Each of these participating businesses from Lake Erie to Southern Lorain County will have something special to offer you. Restaurants/Bars – at least 2 New Orleans inspired special entrees, appetizers, desserts, etc. NOLA inspired cocktails and drinks. New Orleans Mardi Gras beadPick up some purple beads. 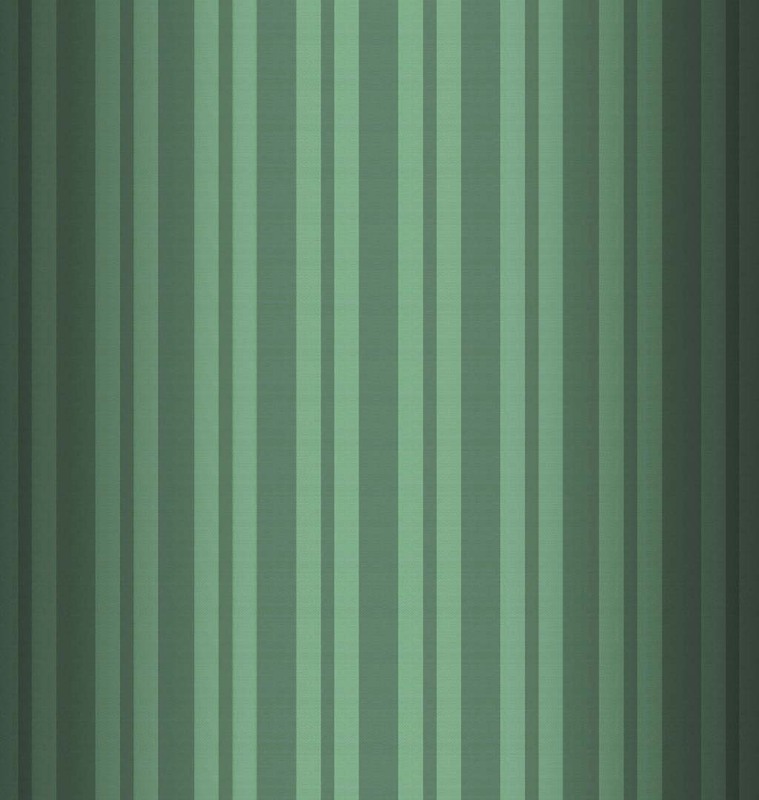 Shops/Storefronts – will display Mardi Gras style decorations. 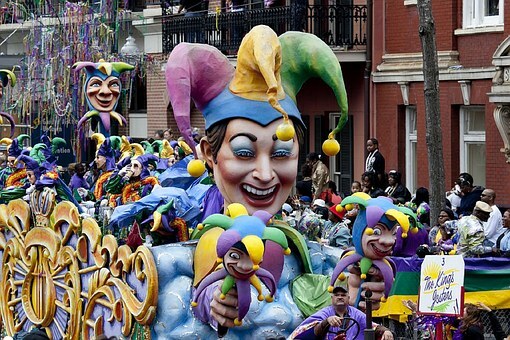 (Because NOLA is very warm and we are very cold the shops will be like the Mardi Gras parade and floats!). Hotels/Bed & Breakfasts – special overnight packages with a New Orleans Mardi Gras theme. We will hand out multi color beads! There is a grand prize! Below is a summary of how to win that grand prize! But for complete OFFICIAL details and RULES go to the Visit Lorain County’s Mardi Gras Page. The participating business where you begin your adventure will give you a passport. Each business will give you beads so carry them with you just like the revelers in NOLA! You then will receive a stamp or code on your passport before leaving each business. Attend the concert event at Stocker Arts Center – Grammy winner Terrance Simien and the Zydeco Experience. Participants must have had their cards stamped at a restaurant , bakery, or hotel (if they stayed overnight), or completed code words from shops/art galleries/theaters. Submit official Mardi Gras card to Visit Lorain County by March 15. There will be a drawing for one winner to receive the GRAND PRIZE – gift baskets of great NOLA products sent straight from New Orleans! 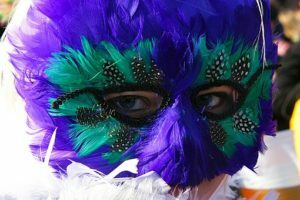 Upon arrival each guest will receive a Masquerade mask to wear, or not, on your LORCO (Lorain County) Mardi Gras adventure. After a tour of the B & B we will treat you to a New Orleans Mardi Gras Special Punch and Pirouline Wafer. And as always you will have use of all of the B & B amenities – hot tub, Asian Spa, Rec Room with pool table, ping pong, and exercise equipment. So come for the fun! Stay overnight or maybe 2! Attend the concert. Get a taste of New Orleans! And get a chance to win that Grand Prize: Hand-selected gift baskets full of NOLA favorites straight from New Orleans!